Vessels the first ULCC to lift a cargo of fuel oil in Rotterdam for delivery to Singapore. Both vessels have also lifted a number of cargoes from the AG for discharge in the U.S. Gulf. Hellespont Tara, the third of the series, was delivered in November 2002, and the Hellespont Fairfax, the fourth and final ULCC, will be delivered this month. Built at Korea's Daewoo yard to LR and ABS class, the vessels set new standards for large tanker strength and speed. Tm. The ships are each built from less than 38 percent high tensile steel. Class Lloyds Register+100A1, Double Hull Oil Tanker. ESP. Exh. Gas Economizer Kang Rim Industries Co. Generator 3 Hyundai 1450kW @ 900rpm IP44 enclosure. Cargo Oil Pump Shinko Ind. Ltd. Cargo Stripping Pump Shinko Ind. Ltd. Tank Cleaning Machine ScanJet Ltd. Cargo, ballast valves Nakakita Seisakusho Co.Ltd. Mooring Winch Rolls Royce. 12 sets Brattvaag WMC4I030-2T-N.
Life Boat Schat-Harding, 2 x 50 persons. Bow Anchor Inchon Iron & Steel Co.
Chain Cable Dai Han Anchor Chain Mfg. Co. Ltd. Magnetic compass 1 SH-165AI Tokimec Inc.
Gyro compass 2 TG-6000 Tokimec Inc. Rudder angle indicator 1 DIC-3C-300R Instrument Co.Ltd. Rudder angle indicator 2 DIC-SL-200R Instrument Co.Ltd. Rudder angle indicator 1 DIC-FF-130R Instrument Co.Ltd. Electronic Indicators, accessories and measuring instruments. The Lemag Premet diagnostic tools can help you optimize your fuel efficiency, and recognize problems before they cause costly repairs. In addition to offering Lemag's product lines, our trained technicians can also perform your engine diagnostics on site. We're available 24-hours a day, seven days a week worldwide. MSHS also specializes in turnkey solutions for diesel engines, turbochargers and filtration equipment. 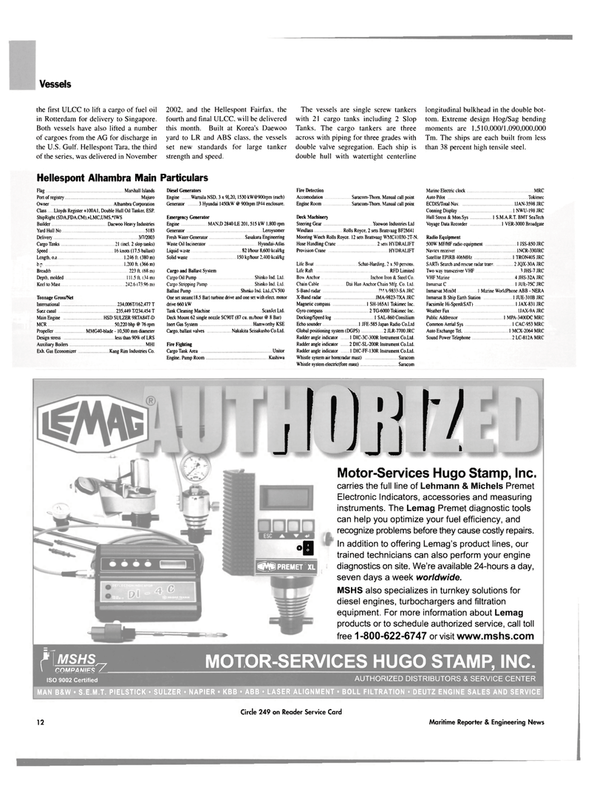 For more information about Lemag products or to schedule authorized service, call toll free 1-800-622-6747 or visit www.mshs.com r MSHS„ nnMPAUiFS / MOTOR-SERVICES HUGO STAMP, INC.